Over 300 people are expected to attend the 41st annual Ocracoke AA Jamboree this weekend. The Jamboree starts tonight, and will culminate with a big meeting Saturday night. The late Tom Hampton started the Ocracoke AA Jamboree and Ocracoke’s regular AA meeting, which calls itself “The Kitchen Table Group” and meets at the Fire Hall. “After you’re dead we don’t mind using your name,” said an AA insider who talked to me for this article. The insider is a longtime local AA member who wishes to remain (surprise!) anonymous, and will henceforth be referred to as X. Anonymity is preferred, X said, even on Ocracoke. The Jamboree has always taken place on the first full weekend of November, and the only year they had to cancel was 1990, when the Bonner Bridge was closed after a ship crashed into it. Last year, after Hurricane Sandy, the Jamboree was smaller than usual. It was hard to prepare for the post-Sandy Jamboree, as travel on and off Ocracoke was tedious at best. The local organizers usually lay in supplies of, say, 100 dozen cookies, and cases of water and soda, and many, many pounds of coffee. Last year, the regular Jamboree visitors called and offered to bring what was needed, and others made treats to share. This year is expected to be busy again. Some attendees come for the weekend, but others like to get here early and rent a cottage for the week. The Jamboree usually brings 300+ people to the island, giving the off-season economy a little boost. The Kitchen Table Group meets Mondays, Wednesdays, and Fridays at 7:30pm above the Fire Hall. There’s a core group of 10-12 members, and as many as 20 people might be there in the summer when visitors join in. In AA, there are two different kinds of meetings: open and closed. Closed meetings are limited to members who identify as alcoholics; open meetings welcome friends, spouses, and those who are merely curious. All the meetings on Ocracoke, including the Jamboree, are open. X admits there’s not a lot of anonymity on Ocracoke, and says that most local AA’s don’t mind being known in the community, especially if they can help another person. But, X said, you’d still be surprised by the people who don’t know who’s who. X was told in the beginning that “You’ll never get sober on Ocracoke in the summer” but winters can actually be the hardest season to get through. X shared a story from drinking days of yore (which can’t be mentioned here without anonymity-busting detail). The upshot: “That was my wake-up call. That's when I joined the meeting." And that was over twenty years ago. Ocracoke’s Kitchen Table Group members are sometimes called upon by the Health Center and local law enforcement to help people get the help they need. That’s what AA is for. And it does work. "It saved my life,” X said. The Jamboree will kick off tonight with a meeting at the Ocracoke School gym. On Friday, they’ll meet at the beach at 4pm, weather permitting. The weekend builds to the all-day discussion meeting Saturday, and the biggest meeting Saturday night (both in the school gym) when selected members will share stories of their paths to sobriety. All are welcome! 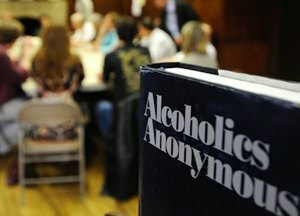 Alcoholics Anonymous is a fellowship of men and women who share their experience, strength and hope with each other that they may solve their common problem and help others to recover from alcoholism. The only requirement for membership is a desire to stop drinking. There are no dues or fees for AA membership; we are self-supporting through our own contributions. Our primary purpose is to stay sober and help others to achieve sobriety.